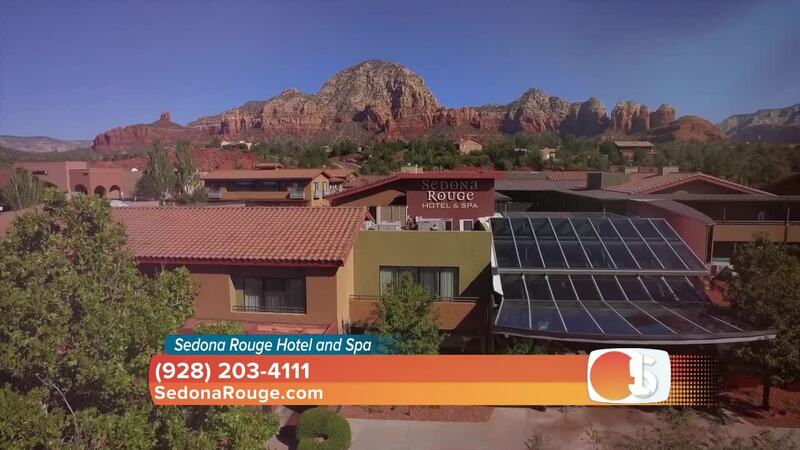 ((SL Advertiser)) Sedona Rouge Hotel and Spa is a red rock oasis unlike any other. Sedona Rouge Hotel and Spa is a paid advertiser of Sonoran Living. Looking for that perfect place to relax and unwind while you are visiting Sedona? Sedona Rouge Hotel and Spa Trademark Collection by Wyndham is guaranteed to be your home away from home. Surrounded by stunning vistas and beautiful red rock mountains, it is here where you will find total bliss. With its powerful spirit and unmatched beauty, Sedona, Arizona, is a location unlike any other. At the Sedona Rouge Hotel and Spa, we strive to emulate that atmosphere. Unwind in style from the comfort of our spacious guest rooms designed in Andalusia ambiance. Each room comes thoughtfully appointed with luxurious amenities such as lambs-wool throw blankets, Soft Kashwére™ robes, Turkish bath towels, dual walk-rain showers, flat screen TVs, and other signature items that will help you seamlessly settle into your temporary home. Sedona Rouge is also pet-friendly and can accommodate your stay in our first floor rooms. If you are up for an adventure, visit with Sedona Rouge's concierge, who will offer the best suggestions to make your trip a memorable one. Take a hot-air balloon ride, visit the multitude of wineries or take a jeep tour to an ancient ruin. Or you just may want to relax at our pool or enjoy a spa day. The Spa at Sedona Rouge voted "Best Spa" in Sedona, is staffed by certified massage therapists and experienced estheticians. Here you will find a full slate of regenerative services, each tailored to your needs. From ancient Ayurveda treatments to reflexology, herbal wraps, and indulgent massages choose the path to rekindle your appreciation for the little things in life. If you have worked up an appetite after your spa experience, head over to REDS, for a bite to eat. Merging American comfort food with healthy epicurean sensibility, REDS Restaurant serves breakfast, lunch, and dinner favorites. Just one bite will help you understand why we were recognized as Sedona's Best Happy Hour and Appetizers spot. Choose from a selection of delicious flatbreads, sip on one of our local wines, and groove along to live music. Combining exceptional service with creative cuisine and beautiful surroundings, Sedona Rouge has long distinguished itself as a premier event venue in Sedona, Arizona. If you are planning an event, you'll find a host of indoor and outdoor settings, including our Andalusia Ballroom, boasting floor to ceiling windows, and the Almeria Garden, offering uninterrupted views of Thunder Mountain. Whether you're dreaming of a lavish reception in our Andalusia Ballroom or an intimate affair in the Almeria Garden, our Wedding Specialists will be by your side every step of the way. From the rehearsal dinner to the honeymoon send-off, we'll make sure your Sedona wedding is filled with happy memories to last a lifetime. We encourage you to book your stay with us, by calling (928) 203-4111 or visit us online at www.sedonarouge.com to book your reservation.